One of the truths about comics is that the more you know, the more you realize there is that you don't know. And, by some strange coincidence, that a whole lot of folks also seem to share these same areas of ignorance. Take the case of Jordi Bernet, for example. He is, without a doubt, one of the most popular and revered European comic creators in the medium today, and he's held that position for any number of years now. And yet most American comic enthusiasts -- including even the most ardent, adventurous and open minded among them -- typically have no idea of who this living legend is or what he's accomplished over the course of an extended and simply stellar career. Did you know that he'll be making he's first trip to the shores of these United States during the weekend of the 20th and 21st of May, 2006? Yes, he really is. Honest. Bill Baker: Who is Jordi Bernet, and why should folks be excited that both he and some of his work are coming to these shores? This trip to the Super-Con in Oakland (May 20 & 21) is his very first trip to the United States. I think that it would be a great opportunity for any Bernet fan to come and meet the man. BB: OK. Well, why don't you fill us in on Clara and what we can expect from her? For instance, I've heard that not only has she been around longer than appearances might indicate, but also that she might not always be the right kind of person to bring home to mother--no insult intended, of course! MA: Clara is your typical prostitute with a heart of gold. She's a single mom trying to raise a young son and trying very hard to give him a normal upbringing. I think the reason this strip has been so successful in Europe is because Jordi Bernet has been able to show you the pathos and humor of the situations that Clara is involved in. BB: So how did all this come about? For starters, why don't you tell us a little about yourself and what lead to Auad Publishing? MA: I started publishing in 1994. The first book I edited -- Toth -- was published by Kitchen Sink and it won the coveted Eisner Award in San Diego in 1995. A couple of years later I published another book on Alex Toth titled, Toth in Black & White. That was also nominated for an Eisner Award. Publishing books on artists and illustrators that I have respected and admired for years is something I always toyed with. Maybe the fact that most of my friends while growing up were cartoon and comic book illustrators planted a seed in me for my love of art. BB: You know, if you don't mind me saying, your backlist is pretty damn impressive. Why don't you talk a little about those earlier releases, and what made each of them special? MA: You know, that's like asking a parent which of his children is special. I love each and every one of them. Each book is different from the last one, so they're all special. BB: As you've noted, this isn't the first book you've done with Bernet, which suggests that you two have a history. So, how did you get to know each other, and how did that relationship grow to include your publishing Bernet? 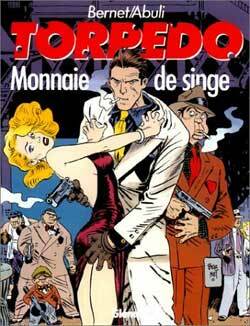 MA: I was introduced to Jordi Bernet like most of his fans, through his Torpedo series. I believe it was when I edited the Toth book that I found out he was a great admirer of Toth's work. I'm sure I must have sent him a copy of the book. And after that we started corresponding. In 1997 my wife and I went to Barcelona, Spain, and he came to the hotel we were staying and invited me to his studio and later on in the evening to his home. I found him to be one of the friendliest and nicest people you'd want to meet. His love for his art is evidenced by his huge collection of original art works by comic book and magazine illustrators from all parts of the world. We continued our friendship by correspondence and phone calls. Then, one day I thought, wouldn't it be neat to publish a book of his art. I brought up the idea to him and he was all for it. And the rest as they say is history. BB: What lead to your decision to do Clara next...and how did Steve Morger and Big Wow Art get involved in the project? MA: Steve and I share the same respect and admiration for Bernet's work. Actually, it was Steve that brought up the idea of doing a book on Clara and inviting Bernet for the Super-Con at the same time. BB: Care to list some of the qualities that Steve and company bring to the table which made them the ideal partners on this outing? MA: It's an ideal partnership because we think alike when it comes to publishing. We both like to do quality books. If you're going to do a book on an artist that you admire and have a lot of respect for his work, then you better do justice by him. I have seen some really poorly done books and I feel sorry for the artist. To me, it's almost like an insult to the artist. But then, that's just my opinion and Steve's. BB: Well, what are the plans for Auad Publishing, near and far term? And can you tell us--please!--if we're going to see even more previously-unpublished-in-the-US Jordi Bernet comics and art work soon...or is there something else you have in mind for your next release? MA: I just finished editing a book on Franklin Booth and am sending it to the printer very soon. This is something I've always wanted to do for several years. You'd be surprised at how many artists have been influenced by his work. From Alfredo Alcala in the Philippines to Bernie Wrightson here in the States. Presently I'm working on a book on the art of Alex Nino. I'm quite excited about these two books. BB: What do you hope readers get from a book you've put out? And is it just about general enjoyment, or might there be some other reasons for publishing these particular books and creators? MA: What I hope from the readers is to have the same enjoyment that I get in publishing my books. Obviously, I have always enjoyed cartoonists, illustrators and artists and what better way can I spend my time than doing books about these people I have always admired. BB: How about you? What does Manuel Auad get from doing all that he does? MA: Satisfaction. A feeling of accomplishment. I'm proud of the fact that I'm able to put out books that are appreciated by the fans of these fine and wonderful artists and hopefully introduce new fans to them. BB: Let's say there's someone out there who's on the fence about ordering Clara. Anything you'd like to say that might make them take that leap of faith and pick it up? MA: Clara is not simply a cartoon character. She embodies the trials and tribulations of everyday life. Clara may be practicing "the worlds oldest profession," but she still manages to see life as something wonderful and full of promise for her and her young son. Also, this is not just a compilation of Clara strips. It includes an interview with Bernet and his writer on the origin of Clara. 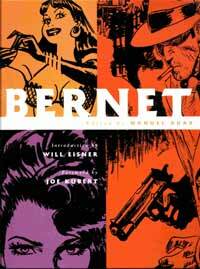 Photos of Bernet with one of his writers in his studio, some preliminary sketches, and some unpublished work. Overall, I would say, if you're a fan of Bernet and Clara, then this book is a must. MA: If anybody has any questions regarding the books I have published they can easily check out my website www.auadpublishing.com or e-mail directly at manuel@auadpublishing.com. I also sincerely hope that Jordi Bernet will be invited to the San Diego Con.